Pinnacle Tents is a leading custom tent manufacturer of quality custom tents and portable shelters. Our team has over 30 years of design and custom tent manufacturing experience to create custom tents and portable shelters suited to your requirements. Tell us your unique custom tent or portable shelter requirement and our experts at Pinnacle Tents will provide the tent design concept, prototype tent, production sample, tent manufacturing and delivery of the custom tent or portable shelter solution that exceeds your expectations. Since we control the entire tent manufacturing process we can deliver our custom tent or portable shelter solutions quickly and at a lower cost. To accomplish this, Pinnacle Tent’s manufacturing requires a minimum production volume of 200 custom tents. 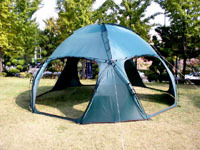 If you wish to purchase a single tent or less than 200 tents from our standard product line, please visit our consumer web site at: www.camptents.com. We have developed lightweight tents, quick set up portable shelters and custom tents that can be custom configured to your application. We offer our commercial customers custom tent colors and private labeling with your logo on any of our tent designs for your company branding, promotional campaigns, or for personalized gift recognitions. 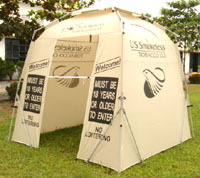 Pinnacle Tents has helped Jack Daniels, Snap-On Tools, Girl Scouts and others to achieve their objectives. See our Showcase Tent Projects, and complete our Request For Pinnacle Tents Quotation Form to find out more about what Pinnacle Tents can do for you.